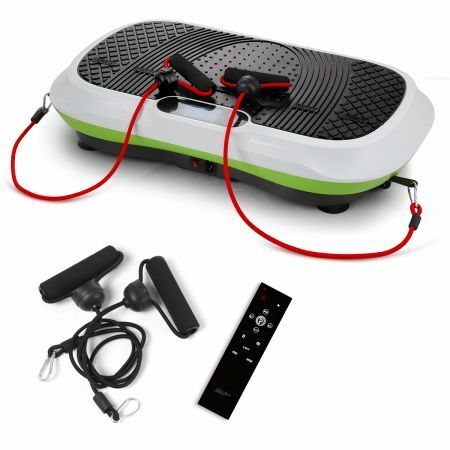 Let the Genki 3rd whole body vibration machine help you get the body you have always wanted. Designed to give you a full body workout in the comfort of your home, it is equipped with a powerful yet quiet motor. Featuring multiple levels of vibration to adjust to your fitness level and increase muscle contractions, this machine gives you a full body workout in a short space of time. The smooth gliding rollers make moving it easy, while the rubber protective surfaces prevent sliding as you exercise. This simple fitness machine is an ideal addition to any home workout routine. 27.5" x 15.5" x 5.5" approx. 41" x 17" x 8" approx. Purchased this after trying a similar one in my chiropractor's office. It works well and has many speeds. I don't know how true all of the claims are for vibration health but I like it and it makes me feel good. I use this vibration platform for 10 minutes in the morning and 10 minutes at night. I'm only on level 3 but will work up the levels gradually to allow my body to adjust. So far I like that it is very invigorating. It totally wakes me up in the morning, my body is warmed up and I am ready for the day.